Health News Blog » Ah-Chew? 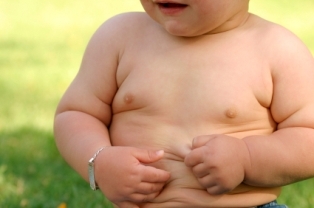 Obese children are likely to develop allergies. While April showers bring the May flowers of the spring (though I’m starting to doubt that mantra, as it’s been raining in NYC for well over a week now), it ushers in an unwelcome rite of season as well: allergies. Ah, yes, allergy season is upon us, a time in which sneezes are aplenty and watery eyes flow like waterfalls, as plumes of pollen saturate the air, covering furniture in brightly-tinted shades of yellow. Some people have been predisposed to allergies from a young age and can’t break away from the toll it puts on their bodies. But some young people develop allergies over time due to constantly being around toxic fumes, air pollution, and tobacco smoke. But could it also be that kids who are obese are likely to develop allergies as well? According to a new study, that may indeed be the case. It doesn’t seem like the side effects of obesity will ever end. From increasing the risk of heart attack, heart disease, and stroke, to diabetes, hypertension and cancer, allergies can now be added to the ever burgeoning list. The study – published in the May 2009 issue of the Journal of Allergy and Clinical Immunology – was conducted by environmental research titans like the National Institute of Environmental Health Sciences and the National Institute of Allergy and Infectious Disease (two research arms of the National Institutes of Health). It involved survey data, as the doctors got information from thousands of participants about their weight, whether they’d been diagnosed with any allergy-based diseases (eczema, hay fever, etc. ), and the number of antibodies each participant produced in their bloodstream. The participants ranged from 2 to 19 years of age, about 4,100 of them in total. What they found was that the most obese participants – those who were in the 95th percentile for their age in Body Mass Index – were about 26 percent more likely to suffer from allergies than the thinner participants. They found this based on the participants’ responses and what the weight of those participants was, but also based on the antibodies they produced. The heavier ones produced more antibodies. Antibodies are the body’s self-defense mechanism for when the immune system is stressed. If you have allergies, your body will produce more antibodies to fight off foreign invaders. So there you have it: you can now add allergies to the ever-growing list of side effects associated with obesity. Just as spring brings May flowers and allergies, it also brings spring cleaning. This year, instead of spring cleaning your office space or patio, perhaps you might want to “spring clean” your diet, by getting rid of the “junk in the trunk” and adhering to a diet that’s clean so it will keep you lean – in both weight and allergy susceptibility. Posted: May 10th, 2009 under Allergies, Childhood Obesity, Obesity.